The two Libyan pilots who flew to Malta seven months ago after defying Muammar Gaddafi’s orders to bomb a small village returned to their country yesterday as heroes. Colonel Ali Al Rabti, one of the pilots, told the press yesterday about the difficult choice that befell them on February 21: “At that point, the country became greater than our families or anything else. The pilots’ defection, which made headlines around the world, was an early confirmation to the international community that the dictator was launching attacks on his people. Their defection and the story they told the authorities shortly after landing here was quoted repeatedly, especially by US Secretary of State Hillary Clinton to justify Nato’s military operation in Libya. 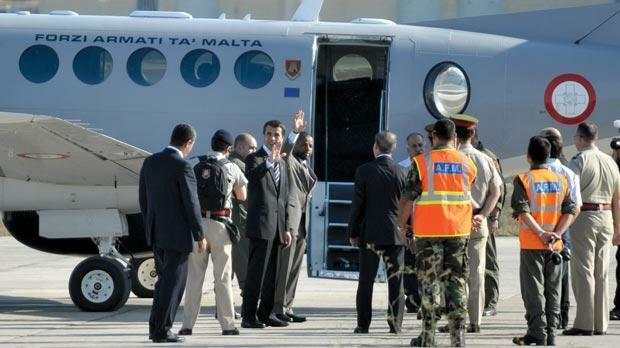 Before leaving on an Armed Forces of Malta plane to Tripoli, the pilots spoke to the press for the first time, thanking the Maltese authorities for their generous hospitality and their firmness with the Libyan regime about not returning the planes. Dressed in smart suits, the two men sported lapel pins with the new flag of Libya and spoke proudly of the rebel victory as they addressed a press conference with Prime Minister Lawrence Gonzi. They spoke in Arabic and Libyan Ambassador Saadun Suayeh translated into English. Photographers and cameramen were not allowed to attend the press conference because one of the pilots, later named internationally as Abdullah al Salheen, was hoping to keep his identity a secret for a bit longer because he still has family in disputed areas in Libya. Col Al Shalheen thanked the government for “courageously” refusing a plane that flew to Malta to take the fighter jets back. “You prevented these plans from being used against Libyan civilians,” he told the Prime Minister, adding that he looked forward to the cementing of stronger relations between Malta and the new Libyan government. Col Al Rabti explained how the pilots decided to defect half an hour after receiving their order to bomb a small village. They flew their Mirage F1 jets at an altitude of just 70 metres to avoid radar detection and contacted the Maltese authorities when 12 miles away from the island. The response was immediate. “We have never regretted choosing Malta... You did not only protect us but our planes too,” Col Al Rabti said with a smile. Dr Gonzi highlighted the importance of their “heroic” defection, which happened only days after the Libyan uprising began. He said this move sent an important signal to both the Libyan people and to the international community. “They made the brave and righteous choice,” he said, adding that the Maltese government did not hesitate in granting them protection, “not even for a second”. The pilots asked for asylum when they landed in Malta. An online petition drew tens of thousands of signatures demanding asylum be granted to send a strong message to the Libyan people but the authorities criticised the petition saying it jeopardised the safety of the pilots’ families back home. AFM commander, Brigadier Martin Xuereb said the pilots were hosted in the Officer’s Mess at Luqa barracks throughout their stay here. When they landed in Tripoli, the pilots were given a heroes’ welcome by family members and well-wishers. The fighter jets will remain in Malta until the arms embargo is lifted and Libyan assets are no longer frozen, something the Maltese government has called for in international fora. The pilots are said to be the only two instructors of the Libyan air force and will now be rejoining the new team.